The hop-on hop-off buses run all year round but it's they're at they become particularly busy in the summer months and over the weekends. We are comparing Malaga Hop-on Hop-off Tour Bus Prices from leading ticket suppliers and Try to find you Cheap tickets prices on the market. There are two lines, the red line and green line, and there are 19 stops in total with buses departing from each every 30 minutes. It offers an affordable and safe mode of transport around the city. 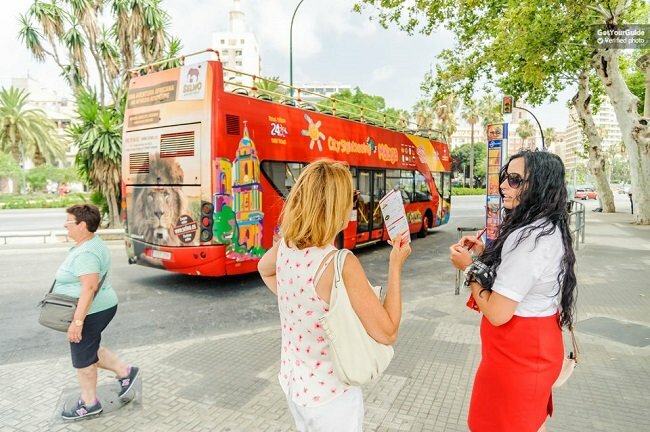 An ideal way to enjoy multiple Malaga attractions, and make the most of your visit, from the comfort of your bus seat. This bus ticket helps to combat complicated transport methods. It’s a great way to learn about the cities history, culture and architecture as the tour comes with an audio guide headset. An efficient way to explore the highlight of Malaga in just 24 hours. Malaga is packed with beautiful gardens, wonderful architecture and a rich history and it’s worth jumping off the bus at every stop to soak up the most of it. It’s an easy way to visit the Malaga Cathedral, Alcazaba and the Castillo de Gibralfaro. Your Experience With Malaga Hop-on Hop-off Tour Bus ? Hop off the bus to visit the ancient Teatro Romano, the Museo Carmen Thssen and the Centro de Arte. Learn about the city as you go by plugging in to the onboard audio guide. Admire Malaga from the comfort of your seat. Choose between sitting on the lower deck or enjoying the panoramic views from the top deck which features an open roof. Have a fun packed day exploring the sights you want to see and tailoring the day around your itinerary. What Malaga Hop-on Hop-off Tour Bus Includes? Free entry into the Museo Automovil, Museo Carmen Thyssen and Museo Picasso. Rise early on the day of your tour to ensure you get the most out of your bus ticket. Take a look at the bus routes ahead of time to plan your day. Travelers Reviews about Malaga Hop-on Hop-off Tour Bus ? All tickets must be printed out to be valid. Tickets booked through Get Your Guide can be fully refunded if cancelled within 24 hours. Tickets booked through Viator can be cancelled for a full refund 7 days in advance. Pick out the top five attractions you'd like to visit in the city and create an itinerary for these using the bus routes. Save time by pre-planning your routes. Check when the last bus runs. Meeting Point: The tour can be started at any of the bus stops around the city.